Ok, all you August birthdays, it’s finally your month and time for the peridot gemstone to shine. And for anyone searching for the perfect gift for someone with an August birthday, look no further than Underwood’s! Peridot is a clear, transparent stone with a green hue that can range from bright green to olive. Its color makes it the ideal gemstone to go with a light summer wardrobe and the range of green hues makes its very versatile. Unlike other gems that gain their color from impurities in their composition, the green of the peridot is an inherent part of its nature. The green color comes from the iron in the olivine, which is the actual name of the mineral. The history of the peridot can be traced back over 3,000 years ago to the time of the ancient Egyptians. It was a prized stone and it is said that many of Cleopatra’s emeralds were, in fact, peridots mined from an island off of Egypt’s coast. Peridot stones are often mistaken for emeralds because of their green color however, they are significantly different. 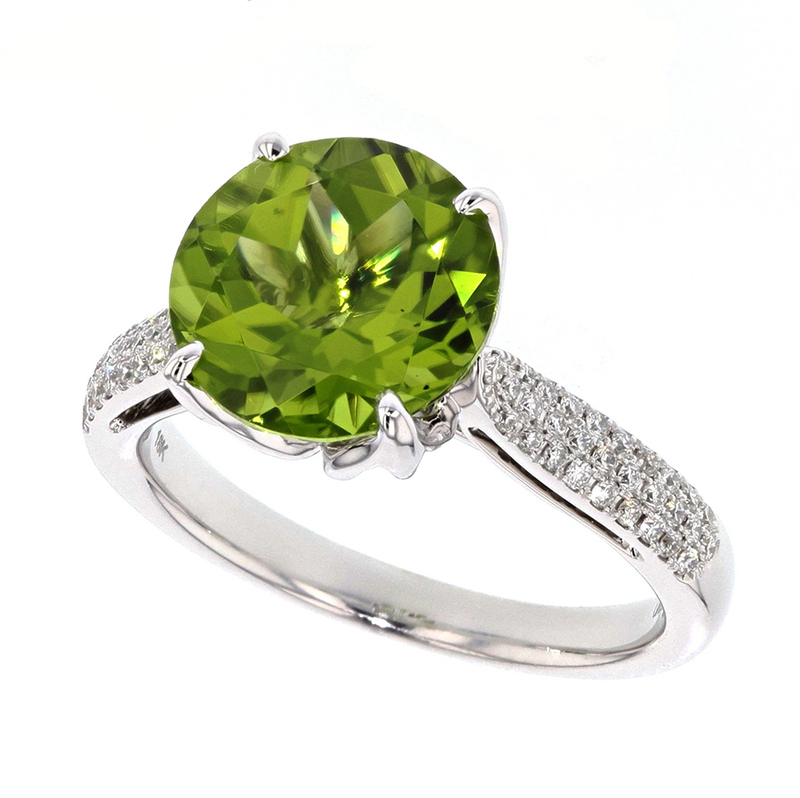 The color of a peridot is lighter and more olive toned while emerald is a rich green color. Peridot is also formed from a softer material and has a rating of 6.5 to 7 on Moh’s hardness scale. Emerald come in at 7.5 to 8. Because the stone is fairly soft, peridot jewelry needs to be protected from knocks and hard metals that might chip the stone. Remove peridot before doing housecleaning or yard work, and avoid using household chemicals while wearing peridot jewelry. To clean peridot, soak it in warm water with a mild dishwashing detergent, and use a soft bristle brush to lightly scrub the jewel. In addition to being the August birthstone, peridot is also the anniversary gemstone for 16 years of marriage, and symbolizes growth and happiness. It the perfect gift for either occasion but anyone can wear it anytime. It’s a beautiful stone with a unique color and is available on all types of jewelry at Underwood’s. For more information on birthstones, be sure to take a look at our Birthstone Guide.